Celebrate your birthday at the Animal Refuge League of Greater Portland! Does your child love animals? 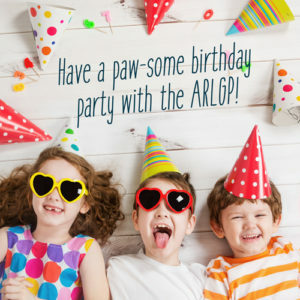 The ARLGP has the purr-fect place for your kiddo’s upcoming birthday. Each birthday package includes two hours in our humane education classroom. Our state-certified educator will provide the group with 1.5 hours of programming, including a shelter tour, activities and games, and a meet-and-greet with shelter pets. Families are welcome to bring food, beverages and cake for the party to enjoy. Delivery by local restaurants is also an option. A refrigerator is available for use. Don’t forget the plates, napkins and silverware! Party guests can bring gifts, however due to time of programming your birthday child may not have the opportunity to open them during your two-hour block. We ask that you please schedule birthday parties at least three weeks in advance of your desired party date. Parties are scheduled on Friday evenings from 5-7pm, Saturdays 10am-noon or 2-4pm, or Sundays 10am-noon or 2-4pm. Need a birthday outside these options? Shoot us an email at education@arlgp.org, we can be flexible! Birthday parties are scheduled upon receipt of payment, on a first-come, first-served basis. You will receive a confirmation email and/or phone call within 48 hours of payment to confirm your child’s party date and time.